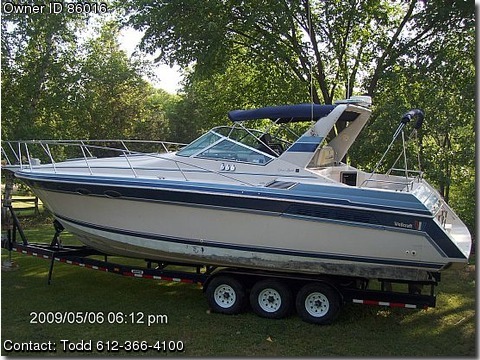 boat configuration includes factory windless, remote spot, ac, heat, ref, ice maker, wet bar, v-birth, aft cabin, 3/4 bath, LESS THAN 475 HRS ON twin 454s, v-drives, shafts and props NEWLY BALANCED AND PITCHED, gen JUST HAD PERFORMANCE TUNE AND SPEC ADJUSTMENTS, fire protection,trim tabs, transom shower, radar arch. ADDITIONAL ITEMS new camper top has seen only one summer of sun, bumpers, shore power cord, life jackets, cd player, radar, loran, ship to shore, depth, Optional tri-axle custom built transport/storage trailer. Many photos available interior and exterior.